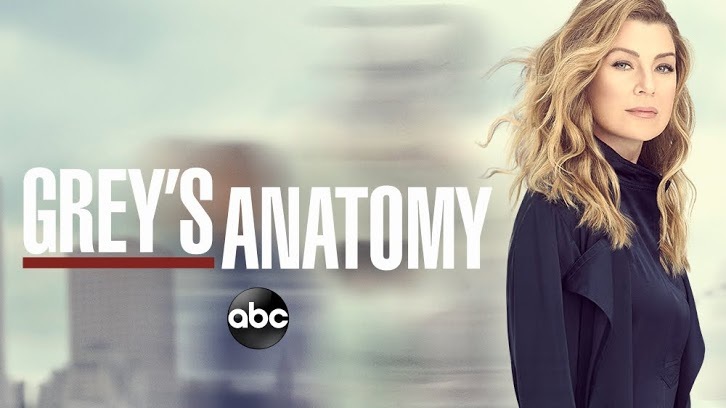 Hello everyone and welcome to the Grey`s Anatomy Season 15 reviews! This season will be covered by myself and STV pro Marko. It's no ordinary season either, because it's the "Season of Love." We're still waiting for the love part, but the season finally feels like it's going somewhere. Pour one out for Nurse Frankie. 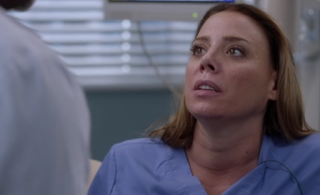 We barely knew her, but thanks to Stacey Oristano and James Pickens Jr.'s performances, it felt like we always had. The appearance of Nurse Ginger (!) who occasionally popped up in earlier seasons of the show helped with that too. When she suddenly doubled over in pain, it was alarming. Her fellow nurses crowded around, but Ginger was especially protective. Dr. Webber Frankie encouraged everyone to stay calm. "Richard is taking care of me. We like Richard." Naturally, Doctor Webber was absolutely devastated. When he walks out to give the other nurses the news, there is so much grief. It's no wonder he goes straight to a meeting. And later to the bar he heard offered shots in exchange for sobriety chips. 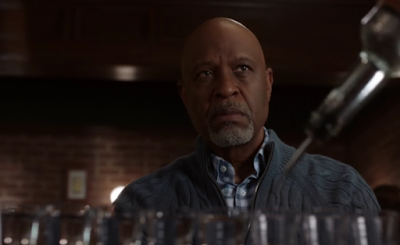 The quiet anger in Webber's demeanor as he watches the bartender line up the shots told us he wouldn't be drinking. But instead he grabbed a bat and smashed up the place, venting all his fury on the bartender for taking advantage of people just trying to keep it together. Webber breaks down, sobbing. He calls Meredith from jail later, asking for her help. When it rains, it pours. Catherine Fox calls Dr. Koracick (so glad Greg Germann is still around) and Meredith to fly out to a special consultation. She shows them scans of a very large spinal tumor. Koracick practially drools over such a challenge. And then Catherine reveals she's the patient. Meredith and Koracick are dismayed. Even more so when they learn it's cancerous. The effect this will have on Webber and Jackson's struggles will be huge too. It's a blow. And yet I can't help but be a bit excited for the storytelling potential, especially in terms of Meredith and Koracick's budding friendship. They have a great rapport. 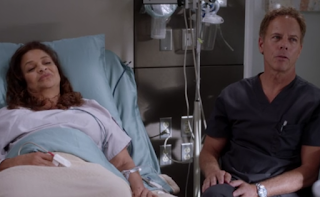 But the most moving part of the episode might be when he explains his relationship with Catherine to Meredith, how she woke him up after the grief of losing his son. "She's my friend," he tells Meredith, with a childlike grief in his voice. The other huge chunk of the episode is devoted to Jackson and Maggie. After a morning spent writhing around, Maggie sees a new text message on his phone. "Some woman is missing you with multiple heart emojis!" 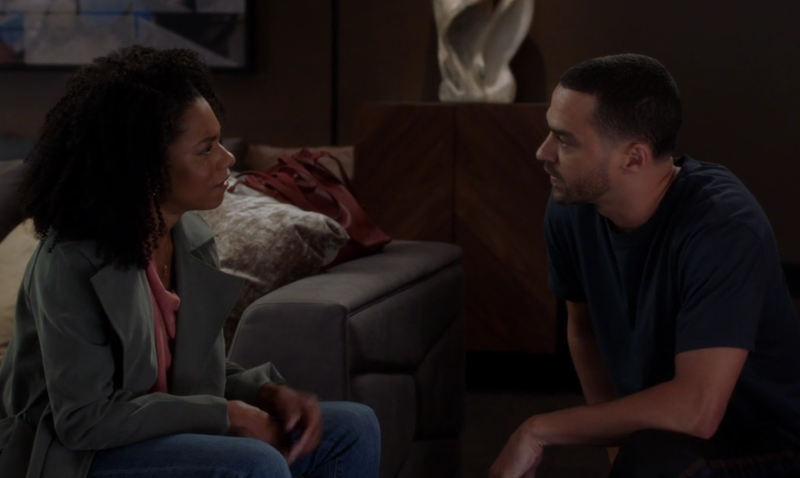 Jackson insists this woman, Kate, is just someone he connected with on a spiritual and emotional level. That, for Maggie, is even worse. It only gets more uncomfortable, as Jackson explains that he didn't just bond with some stranger over his experiences. He's also been talking to April (It was a HUGE mistake for April and Arizona to be thrown out, and I will never ever change my stance that. April and Jackson were meant to reunite, and Arizona's research into the US maternal death rate was also a very important, riveting story that needed to be told.) Maggie does make an attempt to connect with him, sharing how isolated she was from other people her own age, because of her genius. But ultimately she runs away. I fear this couple is meant to be long-term, but I for one am not feeling the chemistry. And I can't shake the constant voice in my head that it should be April here with Jackson instead. Not even a hint of Own, Amelia, and Teddy this week. That was fine, in my opinion, because there were so many other things going on. The midseason finale tonight brings a big storm and maybe some big moments for certain characters! I just hope the show takes a more creative direction for Webber's crisis, other than just continuing to push him to rock bottom. Of course, the season's nearly a third over, and the only thing brewing is when Teddy will spill her secret. There's got to be more!